Flags hang freely. They are not to be draped over anything, and they never touch the ground. When displaying it horizontally, the leaf should be facing up. If you choose to display the flag vertically, the upper part of the leaf should point to the left from the point of view of the observer. Displaying the flag upside down would signify distress. A flag pin is the only respectful way to wear a flag. So put away your flag t-shirts, and put on your flag pins. Place them on the left side of your chest, near your heart. Our flag deserves this most honourable place. Once we’ve loved our flag enough, it’s time to bid goodbye! If your flag is faded or torn, it should no longer be displayed. The only way to ensure your old flag won’t be reused is to burn it. Donate your flags to your local Legion; several times a year they organize proper flag retirement ceremonies. Canada flag lawn chairs can have a seat; our flag should not be used for decoration! The flag is a national symbol that is meant to be displayed respectfully. If you are sitting on it, using it as a tablecloth, or using it as a cape, you are doing it wrong. If you wish to decorate patriotically, think bunting. A red and white motif with maple leaves would be more appropriate. The flag shouldn’t be printed on anything disposable, such as a napkin or a paper plate. Avoid buying these items and opt instead for our national colours! To ice and slice is not nice! If you are planning to bake a Canada Flag cake, or a batch of Canada Flag Cupcakes, opt instead for a red and white cake, with some maple leaf sprinkles if you must! 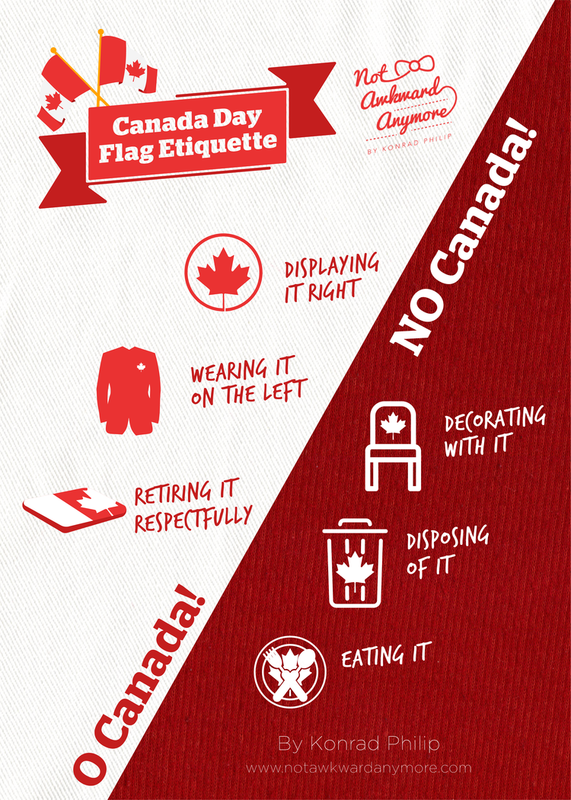 Don’t get FLAGGED on Canada Day! Respecting our flag takes pole position on our national holiday!